After a successful closed beta testing phase (see The new cloud-based Transport Management Service) we have shipped the first generally available productive version of SAP Cloud Platform Transport Management service (TMS) on 22nd of November 2018. TMS is a purely cloud-based solution for transporting development artifacts or application configuration content between SAP Cloud Platform subaccounts (respectively Cloud Foundry spaces). The sources and targets for the transportable content are modeled inside TMS as transport nodes and connected via transport routes. With these parts you can setup your transport landscape(s). These landscapes can of course be more complex than the standard three system landscape shown below. The content is attached to a transport request which is then moved along your transport routes and deployed to the corresponding target accounts. TMS currently supports the SAP Cloud Platform Neo and Cloud Foundry environments as transport nodes (Neo subaccounts and Cloud Foundry spaces). The content can be Multi-Target Applications (MTA), SAP Cloud Platform Integration (CPI) packages and SAP HANA delivery units (DU), if the HANA database is hosted in SAP Cloud Platform. 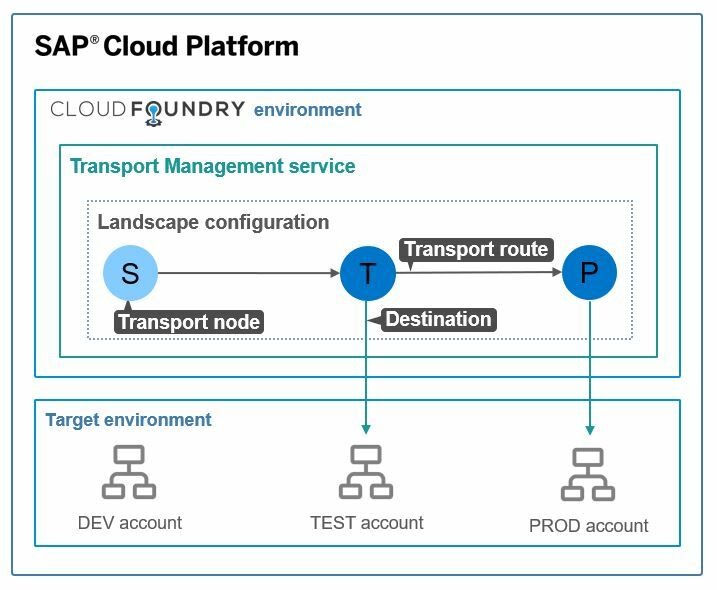 SAP Cloud Platform Transport Management service itself is running in the Cloud Foundry environment and in order to use it you need to subscribe to it from one of your own Cloud Foundry subaccounts. Currently this subaccount has to reside in one of the Amazon Web Service data centers in either Europe (Frankfurt) or US East (VA). The target subaccounts for transporting can reside in any data center and cross-region transport is possible. TMS will first be offered in a consumption-based pricing model at currently 18 EUR per used GB bandwidth of data uploaded to the service per month. This can be paid with Cloud Credits which can be used for all SAP Cloud Platform services offered in this pricing model. From 2nd of April, 2019 it is also possible to subscribe to TMS via the SAP store, please see the corresponding blog by my colleague Boris Zarske. The services details page of TMS in SAP store can be found here. For further information please check https://cloudplatform.sap.com/pricing.html. There is extensive documentation available including a bunch of videos showing the setup of TMS step by step. We will continue to further develop TMS, e.g. by opening TMS to new SAP Cloud Platform environments and new services within SAP Cloud Platform. At SAP TechEd Barcelona 2018 we also tested a graphical display of the transport landscape which will be rolled out in upcoming versions of TMS. Good news. Are there plans to provide this in the subscription pricing model? Thanks a lot! We are working on offering further pricing models – for example, we are considering to offer the service via SAP Store in a subscription model and are evaluating further options, but this is not finally clarified yet. Of course, we would update the blog, as soon as further options should become available. Thanks Boris, Looking forward for more updates. Hi all, for CPI, will there be special handling regarding exchange of target system landscape much as SLD and integration directory does on on Prem PI? Or do you solely rely on externalized parameters for such? the behavior for CPI content transported via TMS is identical to a manual export and import of an integration package. So there is no special handling as you asked for in your question. However, as a (non-binding…) outlook: we are planning to introduce configurable pre- and post-import actions for TMS. Those could include CPI specific activities provided by the CPI development team. Thanks Harald. Sounds interesting. I would suppose this feature would (if it comes to happen) then differentiate TMS more from CTS+ (other than when heading towards “serverless” I would want to use TMS anyways). Is it possible to transport from a tenant in a Global Account (based on subscription model) to a tenant in another Global Account (based on CPEA)? Yes, the license type is not relevant for the subaccounts modeled in TMS. You can transport between different global accounts. They can even reside in different data centers (of course with increased network latency…). Only the Cloud Foundry subaccount from which you subscribe to TMS has to be (as of 26th of February, 2019) CPEA based (and currently located either in Europe or US). Currently all generally available scenarios are based on Multi-Target Applications. So in that sense everything that can be put into an MTA can be transported. For the currently supported artifacts in an MTA see here for Cloud Foundry and here for Neo. As you can see from the list of artifacts this mainly relates to development content like HTML5 applications or nodeJS modules. This covers by far not all available services in SAP Cloud Platform. The architecture of TMS allows the transport of application / service specific content, but this has to be implement on a ‘by service’ level, which means that each service has to implement some APIs that TMS provides. This has been done so far by Cloud Platform Integration (CPI) and other services are currently doing it. So in the moment the answer is that most services are not fully supported by TMS. For us it would be very important to learn which services would be most relevant for being TMS enabled so that we can prioritize our efforts accordingly.